During our recent winter weather our house developed large icicles which intrigued my eldest daughter; so much so, she requested one. So in came the icicles along with another container of snow. Much better than freezing outside right? Of course the first thing they wanted to do was eat them! I mean catching a falling snowflake on your tongue may not be bad, but icicles??? Yuck! 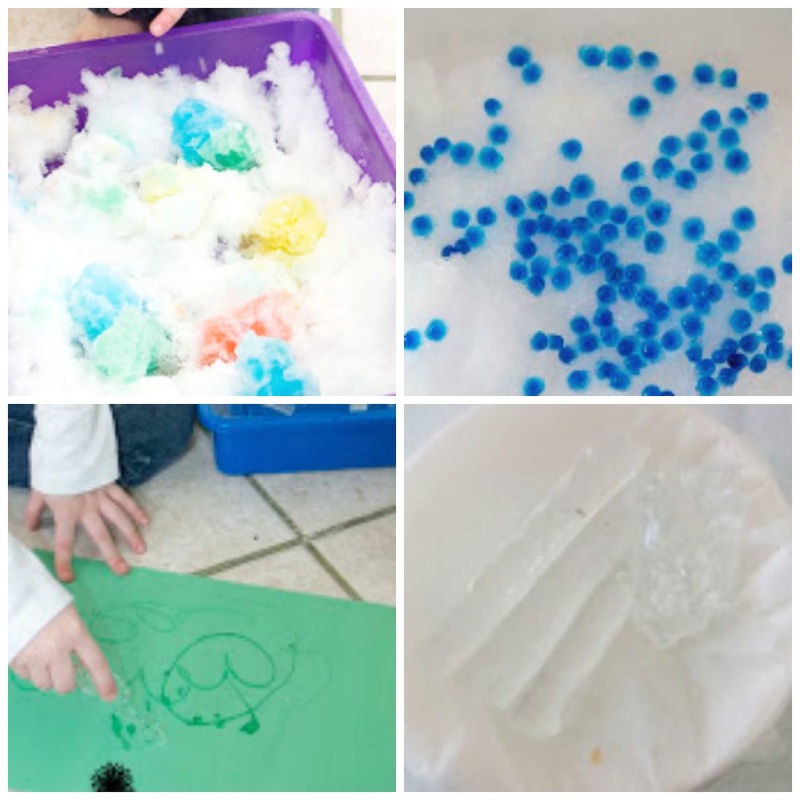 This lead us to what would be the first of four preschool STEAM activities with our ice and snow. 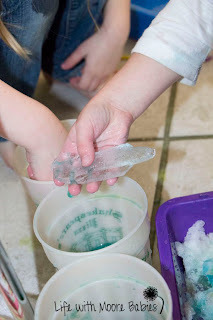 An Experiment to See if Icicles Clean? 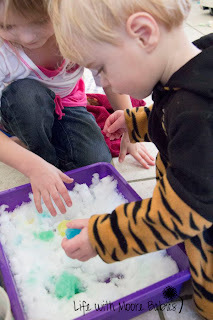 You can probably guess the outcome of this science experiment, but it is great to show the kids first hand why an icicle and a popsicle are not the same! 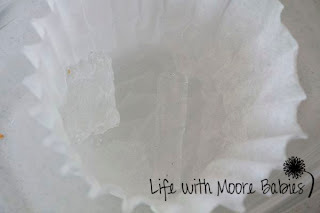 To start with, place some icicles in a coffee filter. 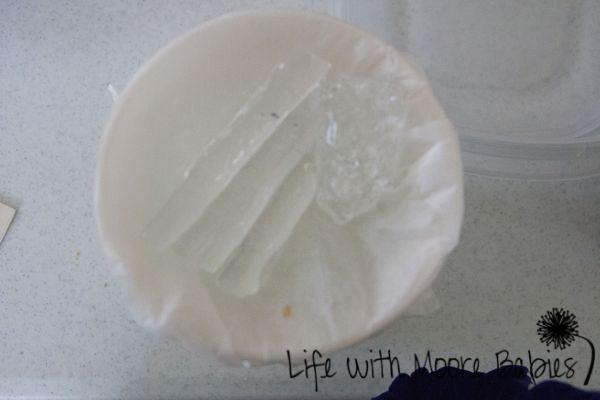 Now rubberband the coffee filter to the cup, so it can catch all the water as the ice melts. After they melt, you can clearly see dirt left behind in the coffee filter. 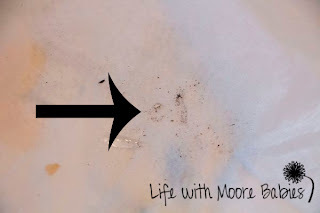 Obviously icicles are NOT clean. 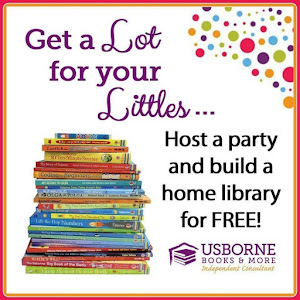 After seeing that I wouldn't think kids would even want to eat them, but if they do at least you can show them why you said no. Kids can be impatient, especially younger ones, so while we were waiting to see how filthy our icicles were, they needed something to do. We decided to make art with the remaining icicles. 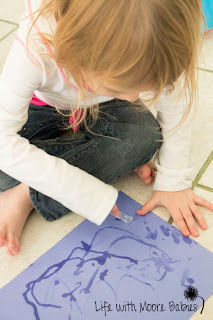 This is such a simple process art activity! 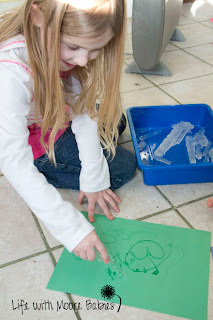 Lay out some construction paper and hand over the icicles. They figure out pretty quick that they can use them to draw on the paper. The girls were even more amazed that their pictures disappeared as they dried! 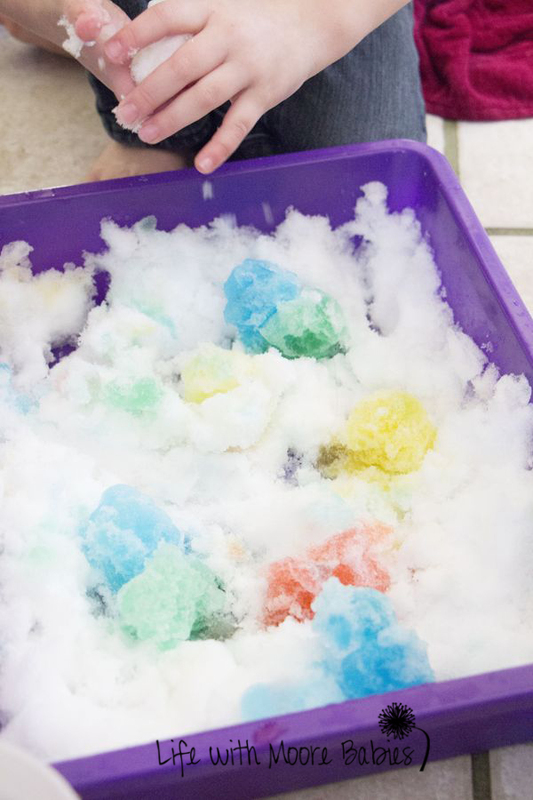 You remember I mentioned a container of snow. 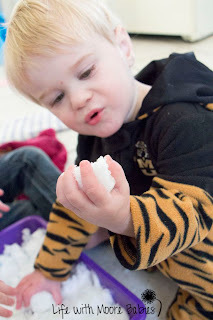 Well, as soon as we came in, we stuck the snow in the freezer, so it would still be snow when we went to play with it. 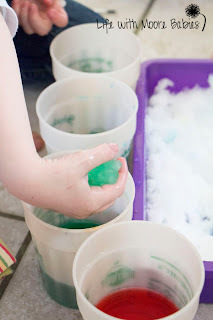 Experiment to See if Snow Made of Water? The kids explored the snow a bit, and then I asked them was snow was made of. They knew it was water but they were a little hesitant about believing it after seeing the icicles which were clearly made of water. So it was time for another experiment. 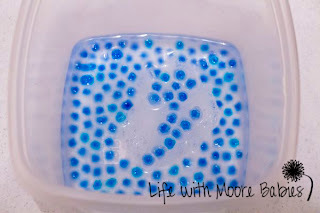 We love water beads, and usually have them around for sensory bins. They know water makes the water beads grow. so would snow make them grow too? We placed some of our snow in a smaller container, probably about 2 cups worth. 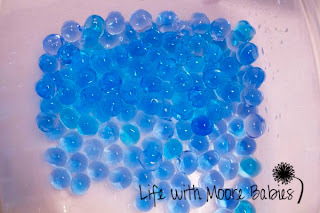 And we threw in a handful of water beads. 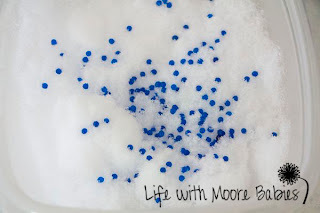 We used colored water beads, so the changes in them would be a contrast to the snow. It may be harder to appreciate the growth with clear beads. 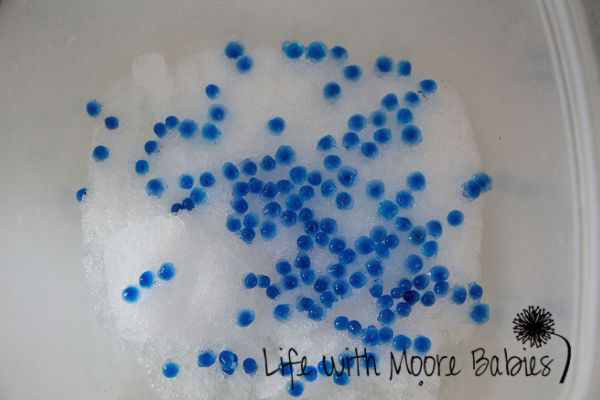 After maybe 30 minutes, we could definitely see some change in the water beads, and the snow was melting. 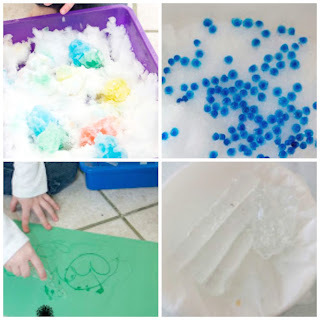 We checked again a bit later and noticed that our beads were bigger and our snow was gone. In it's place was water. 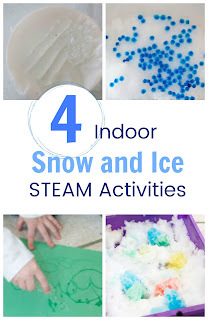 We clearly could have stopped our experiment here as it was obvious snow was indeed made of water. But we didn't. 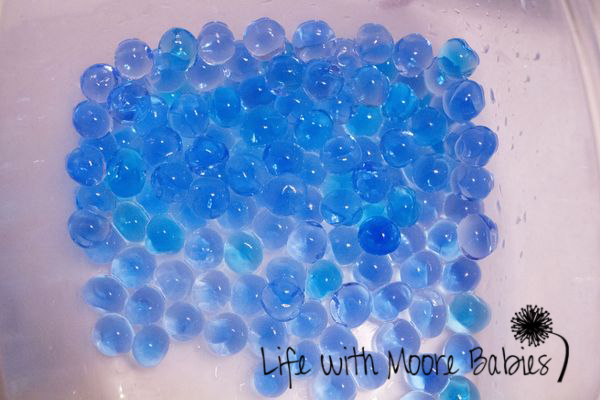 We let the water beads grow more, so the kids could enjoy them later on. 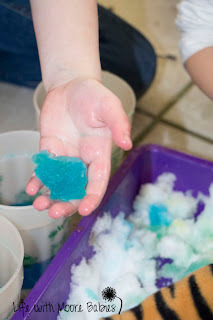 Like before, the kids needed something to occupy themselves while waiting on our little experiment. 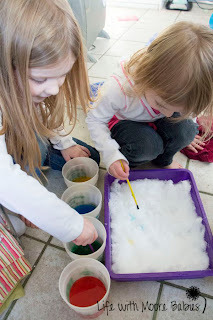 We decided to paint on the snow! The remainder of our snow was still in our container just waiting like a blank canvas. I mixed some food coloring into cups of water and handed them to the kids with paintbrushes. The painting was fun for a while, but like usual my kids are a little impatient and a lot impulsive. 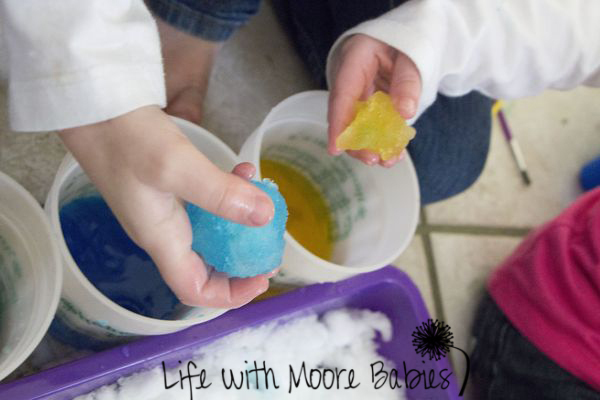 My daughter decided to stick an entire ball of snow in one of the cups! I thought for sure it would just melt and that would be the end of it. The freezer had done a good job with keeping the snow cold. It barely melted at all and the whole thing changed colors! Now we had some real color theory going on. They would mke their colored snowballs and then smush them together to mix the colors. More and more colors got added and mixed as they played. 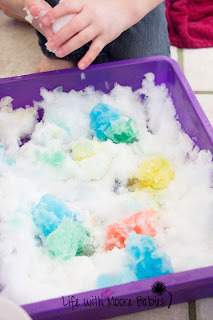 Then the girls tried dipping the leftover icicles in our food coloring to change them color, but it didn't work of course. Oh well, not all experiments work, and they were still having a good time with their snowy art. 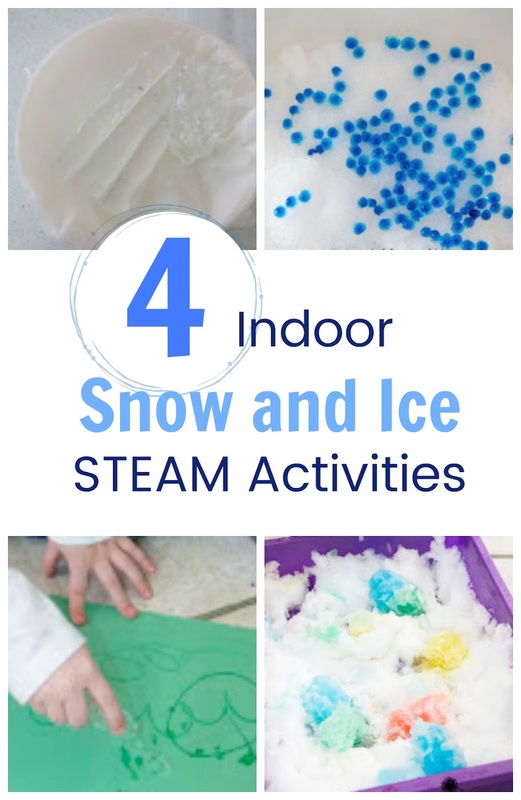 Who would have guessed that a little snow and ice could produce hours of STEAM fun for preschoolers! If it hadn't been for it melting; I bet the fun would have lasted longer. 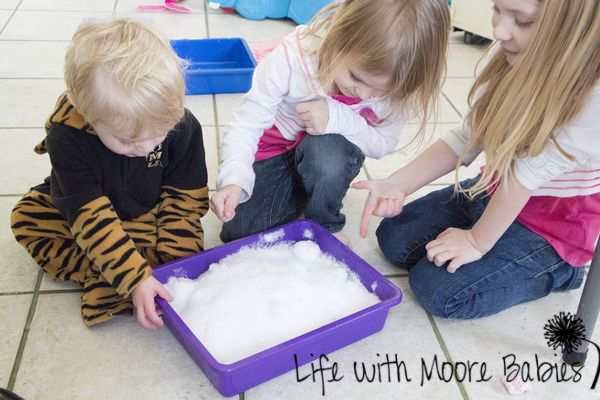 I for one would love to only play with snow inside, but I think they would miss sledding and snowman building. It was warm while it lasted though, and none of the experiments were eaten!